It's all about density, people. The Whole Foods Market salad bar is the land of milk and honey (but more like the refrigerated aisle of tabouli and chicken salad) for lunchers with enthusiastic taste buds. Yes, there's much beyond traditional salad ingredients to devour at this dining utopia. But with so many options and a steep price tag, it seems to be a salad bar for the elite. We took a jaunt to this very salad bar to prove affordability is feasible. 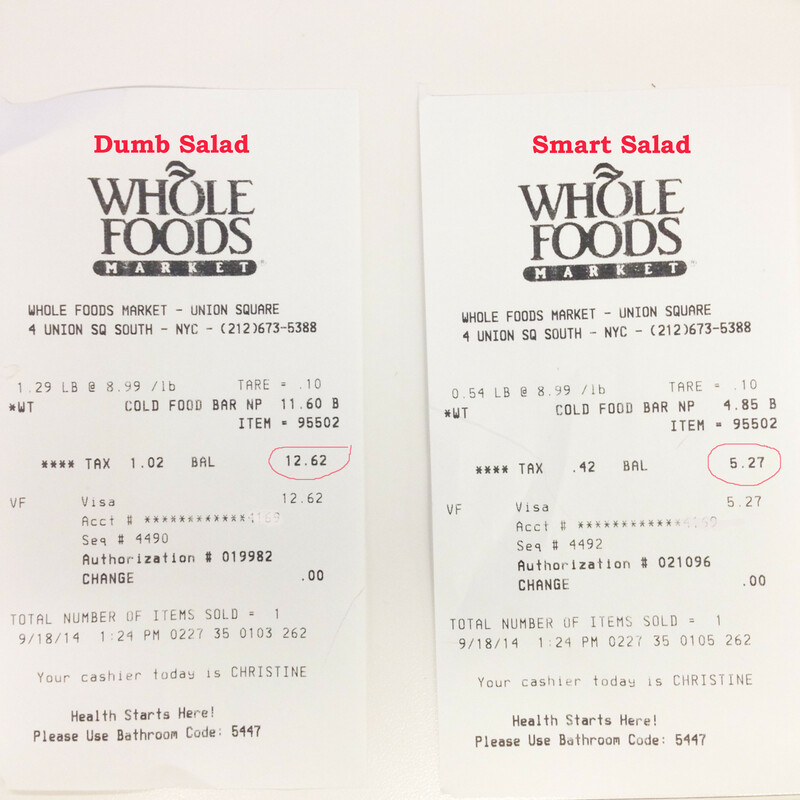 Below you will see an example of an expensive, brashly-made salad (dumb salad) and a reasonably priced, calculated salad (smart salad). Dumb salad ingredients: Mixed lettuce, broccoli, cauliflower, fruit salad, red kidney beans, hard boiled egg, scoop of tuna, ranch dressing. Smart salad ingredients: Mixed lettuce, roasted red peppers, artichokes, feta cheese, olives, walnuts, cashews. The difference in price is extreme (about seven bucks! ), yet both salads offer enough satiating nutrients and taste variety. 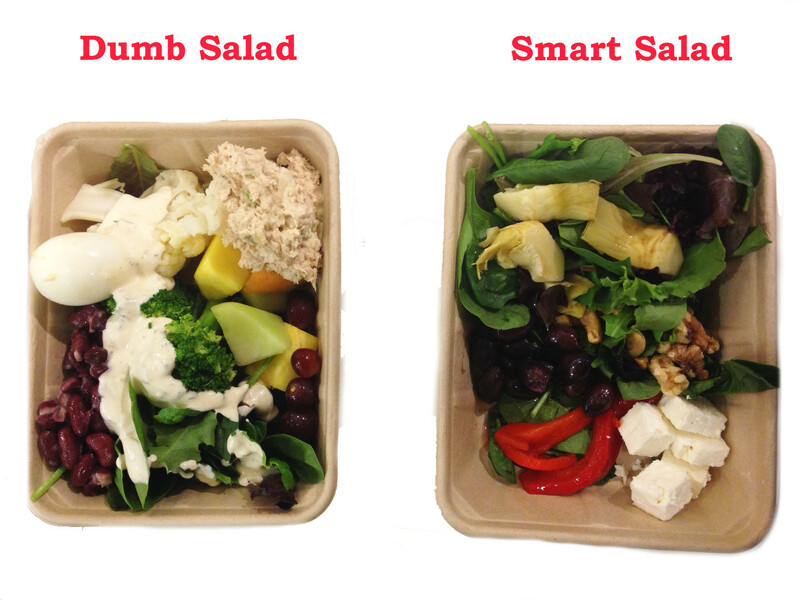 Smart salad just took a few seconds longer to plan. Enjoy those free bathroom codes. Do not get hard-boiled eggs. Do not. Eggs are a wonderful lunch choice -- they're filling and packed with protein. But selecting hard-boiled eggs from the salad bar is foolish. They are heavy in weight and take up a lot of space. Instead, you could buy a dozen eggs for less than three dollars at a local bodega (but probably not at Whole Foods), boil them all and distribute them in your salads throughout the week. That would be smart. Similar to the egg predicament, many tasty vegetables can be purchased outside of the salad bar for much less. (If you're really pinching, a frozen bag is often less expensive.) That vibrant, green piece of broccoli may entice you, but its high water content will weigh down your container. Keep other individually served vegetables and fruits that take up a lot of surface area -- like cauliflower, cucumbers, tomatoes -- out of the box, too. Choose the "fancier" veggies instead. Olives, artichokes and roasted red peppers can cost a pretty penny when sold on their own. The salad bar is an equal opportunity vendor, so plop a few of these more gourmet-seeming vegetables to get a better bang for your buck. Don't get carried away by novelty. When, besides at the salad bar, do you get to combine your cross-cultured love for stuffed grape leaves and seaweed salad in a single dish? It can be tough to resist packing every intriguing mix-in into your salad, but if you're not careful, the ounces will rack up. If you are easily excited by variety, inspect the entire bar and walk a full lap before making any selections. You'll be less likely to indulge the kid-in-a-candy store-turned-adult-at-the-salad-bar that you are. Fruit salad is the forbidden fruit. You may choose whatever salad bar fixings you crave, of course, but that colorful bin of fruit salad is just another substantial mass to your box. You'd save more by purchasing an additional prepackaged side of fruit salad or, better yet, a single apple. Whole Foods' salad bar is rife with nuts like cashews. almonds and walnuts that tend to be pricey when sold on their own. Top your salad with a melange of these and reap the many benefits of the near-weightless snack while beating the salad bar system. Beans -- the mushy types like kidney and cannellini, in particular -- are dense and will sink to the bottom of your box. If you need a bean fix, buy them canned. This is good news. When you add cheese, you're definitely milking the salad bar system. The bar presents a bounty of cheeses; when possible, choose the shredded or grated cheeses over the cubes (it's all in the weight, people). Even still, if a square of feta is singing your song, welcome it to your salad box. Avoid scooping up the salt water solution along with it. When it comes to portion control at the salad bar, Whole Foods hands you the reins. No matter your hunger level, you're more likely to fill a bigger box with more food (and underestimate how much you're taking). In all likelihood, you will be satisfied by what you fill in the small box, and you'll spend less, too. Win. Again, density is the fundamental principle for navigating the salad bar. When presented with shredded carrots or baby carrots, choose the former. You'll be able to enjoy the taste of carrots without sacrificing as much cash. Take your dressing on the side. Kindly ask one of the Whole Foods employees for a small dressing container. Dousing your greens in creamy ranch before check out will add unnecessary ounces to your salad's weight. Be mindful of the marinade. If you're craving something from specialty salad section -- like the golden sesame tofu that comes in a thick soy glaze -- use precision to pick out the pieces from their marinade. Your items will retain the flavor of whatever they're dressed in, but you won't have to pay for the excess saucy stuff. You can beat the salad bar.